Those of you who follow RGCD's activities on Twitter and Facebook may recall that Jamie Howard, Dugan Jackson, Ian Ford and I released a cute 1-4 player shmup/avoid 'em up at this year's Sundown demo party in June. A sequel-of-sorts to r0x, a game developed by RGCD and NoExtra for the Atari STE back in 2009, r0x (Extended Play) was developed initially for the Android-based Ouya console - and here we are, just over a month later with a final(!) version for both Ouya/Android and PC (Windows). 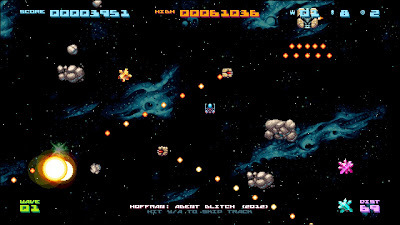 More avoid-em-up than traditional shmup, r0x EP is a simple arcade game where ammo is scarce and you are rewarded generously for taking risks and flying dangerously. Graze rocks, bullets and enemies to recharge your cannon and thrust at breakneck speed through the deadly meteor storm to rack up an epic score! Developed over the course of two-and-a-bit months by a core two-man team, r0x EP improves on the original r0x game by introducing a wide range of Proximan renegade scum to battle, nine objective based 2-4 player vs modes and brutal zero-g cosmonaut wrestling! Two single player modes with separate high score tables, and nine local multiplayer modes! Achievements system and player statistics! Seven track user-selectable OST composed entirely on an Amiga 1200 by demoscene musician h0ffman! Awesome artwork by Tikipod and Vierbit! Although originally designed as an Ouya title, it's worth noting that r0x EP also runs on similar spec Android devices, but requires a controller to play. The Windows version supports keyboard controls in addition to Xbox 360 joypads. r0x EP is available for FREE over at itch.io, but if you can afford to support us by throwing us some digital loose change then we'll be incredibly grateful. If you enjoy the game, please give us a thumbs up on Steam Greenlight! If successfully greenlit, we'll release Mac and Linux builds in addition to making further enhancements to the game. Oh, and I should probably mention here that we're working on a collectors edition physical release of the game too, limited to 100 numbered copies. There'll be more news on that in the future, but for now get out there and blast some Proximan scum!